For Microsoft it was always going to be much, much more than just a game. 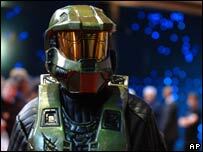 The company sees Halo 3 as not just a profitable computer franchise, but a key part of its global business strategy. That is why it has spent $10m (£5m) on what it describes as the "the biggest entertainment launch of all time". The Halo phenomenon underscores just how big the games business has become: the days of small developers servicing the demand of a minority, geeky, market are long gone. The US-based Entertainment Software Association estimates that the computer and video game industry's revenues totalled some $7bn in 2005. It predicts this will grow to more than £15bn by 2009. The market is now dominated by the three major console manufacturers, Microsoft, Sony and Nintendo. But other significant players include independent studios that produce "cross-platform" games - those that will play on more than one console (or PC). However, it is not uncommon for Microsoft or Sony to buy up smaller studios in order to preserve exclusive content. The studio behind the Halo series, Bungie Studios, for example, was bought by Microsoft in 2000; a move that has paid off many times over for the software giant. The question is: can this mix of console giants and independent studios survive. Or will Microsoft, Sony and Nintendo sweep all aside? Industry analysts see the Halo 3 phenomenon as key to understanding Microsoft's direction to dominate an increasingly uncharted, but potentially profitable, market. "Halo 3 will much more than a massively profitable game for Microsoft," says game industry consultant Margaret Robertson. "It's going to be the standard bearer not only for the Xbox and all it can do, but also for Microsoft's profile worldwide." Neil Long, editor of the games industry magazine MCV, agrees. "Microsoft are hoping that not only will people buy the game, but will pay £40 or so to subscribe to Xbox live, plus all the other services Microsoft will offer, such as downloading movies," he says. In short, the company is using a game to increase sales of a console which can then generate extra revenue, potentially exceeding the profits made by the Halo 3 franchise. It is a model analysts say is being attempted by the other big console manufacturer, Sony. The company also plugs the ability of the PlayStation 3 to do far more than just play video games: it can show high-definition DVDs, connect to the internet and, with the right accessories, record TV programmes. Next year should also see the release of the company's so-called "Halo-killer": a game called Killzone 2. This will be an update of a first-person shooter game with a plot that revolves around battling mutant humans attacking from outer space - very similar to the aliens in the Halo series. But Ms Robertson believes the game will not capture the degree of hype that Microsoft has achieved with its current launch. "Halo 3 is a special case," she says. "From what I've seen, Sony just hasn't got a game that has captured public imagination to the same extent. "Plus Microsoft have the advantage of an homogenised fan base, largely young, male and American. This enables Microsoft to be much more focussed and output all their effort into a single huge hype." By contrast, she says, Sony's customer base falls into a wider demographic. "They are much more split across countries, age and gender," she says. The third big console company, Nintendo, has by contrast pursued an entirely different - and so far very successful - strategy. "Instead of using the console-strategy to pull in new customers, Nintendo have expanded their market by persuading traditional non-gamers to play their games," Ms Robertson explains. With family-friendly consoles like the Wii, Nintendo has helped create a level playing field where everyone is a beginner. By focussing on the game, rather than the technology, Nintendo has up until now managed to sell more consoles in the US than Sony and Microsoft put together. It is a lesson noted by its competitors - both now locked in a fierce competition for the very best games to showcase on their consoles. Just as Microsoft bought up Bungie, so Sony recently bought Evolution, a small British games studio which had already developed a game - Motorstorm - for the PS3. However, some independent game-designers - such as Electronic Arts, maker of the popular EA Sports range - are simply too big to absorb. Ms Robertson sees no reason why this industry mix will not continue. "The future doesn't belong solely to the console manufacturers," she says. "Sony and Microsoft simply can't make enough games to satisfy their customers. What exactly is a next generation game?